Mithra and Humes (Male and Female). «Final Fantasy XI» is set in the world of Vana'diel. As an adventurer of Vana'diel, you live a highly subsidized existence. For instance, one of your perks is free housing courtesy of your starting city. You also get to stay in rent-a-rooms in other cities, ironically without having to pay rent. Adventurer perks further include housekeeping in the form of a Moogle, a tiny bat-winged plush-demon who is somehow always waiting for you wherever you are staying, having already brought with it all your stuff. This adorable creature is as such more magically potent than any monster you will encounter on your adventures, and is therefore potentially the most dangerous creature in the world. The Kingdom of San'Doria: Populated by the Elvaan, a tall, elf-like race with pointy ears and a martial disposition. Unlike traditional fantasy elves, Elvaan are quite bad with magic and instead prefer to solve problems with good old fashioned violence. The Federation of Windurst: Home of the magic-savvy TaruTaru, a race of tiny, short-legged, big-headed bundles of cuteness. The TaruTaru also have the characteristic of looking like the chibi-style sprites from the early «Final Fantasy» games. Windurst is also inhabited by a mercenary group of nimble cat-women called the Mithra. They fill the anthropomorphic-animal role which is required by law in all Japanese RPGs. The Republic of Bastok: The industrialized home of the Humes and their Galka laborers. The Galka were originally from the desert kingdoms across the sea, but lost their lands to giant ants. They are huge, hulk-like and can take a beating. Although they look very butch and manly, they are sexless beings who procreate through reincarnation. The Humes are just regular humans, and are not really special in any particularly way. Compared to a game like «The elder Scrolls: Skyrim», there is very little character customization in «Final Fantasy XI». You pick a race, decide if you are male or female, choose between light and dark hair and one of eight standard heads... and that's it! There is no deciding on body type, tweaking of cheekbone height, deliberating over eye color or any such nonsense. Some would begrudge this lack of freedom, but it has one big advantage: You can start playing a lot sooner. If I'm given endless amounts of character customization options, I tend to use endless amounts of time customizing my character. Also, all the faces, hairstyles and the standard body type, are tastefully designed. As a result, the world is populated exclusively by attractive people with good physiques. This is «Final Fantasy» after all, where traditionally, everyone has awesome and elaborate hair... Always! The mechanical differences between races are noticeable at the beginning of the game. For instance, a TaruTaru start with higher potential to cast more and stronger spells than for instance a Galka, but a Galka is a lot harder to kill. Over time however - as your character levels up - the differences become reduced. When one reaches the level cap, the differences are for the most part negligible. This is a good thing, as one of the cool things about «Final Fantasy XI» is that characters can - with the help of the above mentioned Moogle - change jobs whenever they like. If you for instance start out as an axe-swinging warrior, you can easily change into a mage class later, and then back again. The convergence of racial attributes at late game allows every character to be suited long term for whatever jobs they choose, even though race might have placed restrictions on them in the early game. One of the most awesome aspects of «Final Fantasy XI» is the job system. As mentioned above, each character can be any job they like, and change between them at any time. This eliminates the need to make multiple characters to try out different play-styles, and as such you become more attached to the one character you invest in. - Thief (agile backstabber with the ability to find and steal treasure). When you reach level 30, you can start quests to unlock so called advanced jobs. They are generally more exotic than the original six, and most of them provide a highly specialized approach to one aspect of the game. That does not mean that the original six jobs are made redundant or obsolete. For instance, although advanced jobs include things like Paladin (a variation on the Warrior job, but with specialization in the sword/board combo and the ability to cast limited white magic), the original Warrior job is still better at killing things. The Paladin is however superior at defending itself and others. Advanced jobs are numerous, and new ones are sometimes added to the game with expansion packs. Relatively early in the game, you can unlock the ability to have a second job active at half the level of your primary job. This allows you to combine jobs, in such ways as to improve what you are already good at, or compensate for abilities you lack. It's generally more efficient to boost your main job's already existing strengths, than to compensate for functions you don't possess. For instance, becoming a WAR/WHM (a Warrior with White Mage as a support job) to add healing spells to your Warrior repertoire will work, but it is better to just be a Paladin, who have those capabilities to begin with. Improving a Warrior can however be done by becoming WAR/MNK (a Warrior with Monk as a support job) to add counter-attacks to your already awesome withstanding-and-dealing-damage capabilities. The mechanics of combining traits from multiple jobs, as well as the actual jobs present in the game, are strongly reminiscent of the job system in «Final Fantasy V» from 1992, which was not released in the west until much later, because it was deemed too complex for the average western gamer. The job system and adventuring. Mastering all the jobs is not for every adventurer. It is however, not uncommon to have at least one fighting job and one mage job at the level cap, as well as a number of different support jobs at half the cap. I remember playing for a whole year, before I maxed out my first job. In this time, I experimented a lot with all of the other jobs in order to find out what worked for me, but mostly because it was fun. As such, it would have been possible to get to the cap a lot quicker, but I have always felt that playing a game is more about the journey than the destination. And in «Final Fantasy XI», there is rather a lot of this journey. 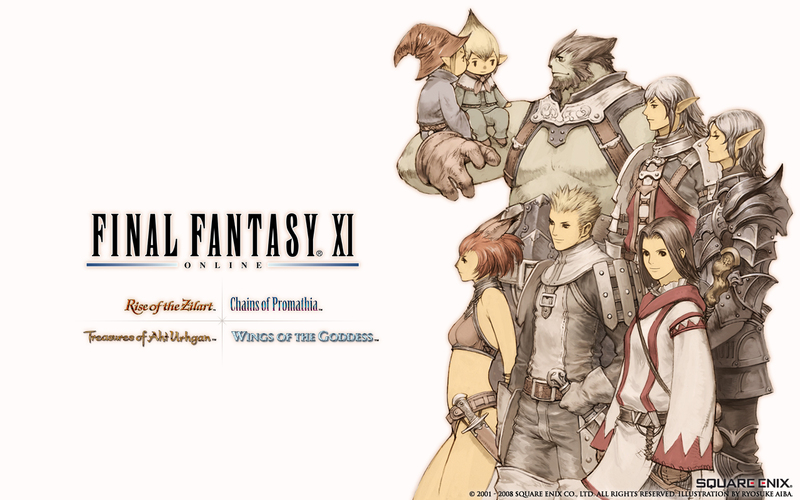 The storyline of «Final Fantasy XI» begins with the Crystal War, in which a Shadow Lord from the north and his beast-men army of orcs, demons, behemoths and other scary monsters were vanquished by the allied nations of San-Doria, Windurst and Bastok, under leadership of the grand duchy of Jeuno. The war culminated with the sacking of the city of Tavnazia (as seen in the video below). The Shadow Lord's armies deployed their full might in that battle, thus allowing a small band of heroes to infiltrate the enemy stronghold in the Northlands and turn the tide of the war. Twenty years later, as the world has settled into a state of relative peace and quiet, your story begins. Your adventures will take you from your starting nation, via the city of Jeuno, by ship across air and water to the four corners of the world, to citadels in the clouds, the voids of emptiness, the depths of the sea and eventually into dimensional paradoxes and alternate timelines. FFXI was a great experience in my gaming life, not every MMO have the "all world" server population (some ppl. sees it as a down side), but in my days of playing it was a good thing. With the new changes/renovation its playstile very newbie friendly now, but the secret for maximun enjoyment, imo, is finding a LS (group/gild/etc) early in the game and gather information about what you want/need ingame. Keep up the good work and waiting for more chapthers. With the addition of Treasures of aut Urgan and Wings of the goddess more jobs were realeased! Upon doing quests to unlock each job class you could now play, Corsair, Puppetmaster, Bluemage, Dancer, and Scholar! Also there is a new expansion listed to be realesed in late march 2013 with two more jobs to keep us entertained! Also keep in mind many many changes have occured over the years to make leveling easier. All in all i love the game and have found none like it on the net! Keep up the good work i look forward to your future instalments. Is the «Piston» Steam Box a viable gaming PC?